Step 1 Stir warm water with sugar together in a bowl. Sprinkle yeast packet over water mixture and allow yeast to slightly foam, about 5 minutes. Step 2 Whisk eggs, canola oil, and vinegar together in a bowl until frothy. Step 3 Combine flour, xanthan gum, and salt together in a bowl until evenly mixed. Beat yeast mixture into flour mixture using an electric mixer until evenly combined. Beat egg mixture into flour mixture until just combined; stir in dill and garlic. Beat dough on high until dough holds together and is sticky, at least 4 minutes. Cover bowl with plastic wrap and set aside to slightly rise in a warm area, about 30 minutes. Step 4 Preheat oven to 350 degrees F (175 degrees C). Grease a 10x13-inch baking dish. Step 5 Form dough into 12 large rolls and arrange 3/4-inch apart in the prepared baking dish. Step 6 Bake in the preheated oven rolls are lightly golden, 35 to 45 minutes. 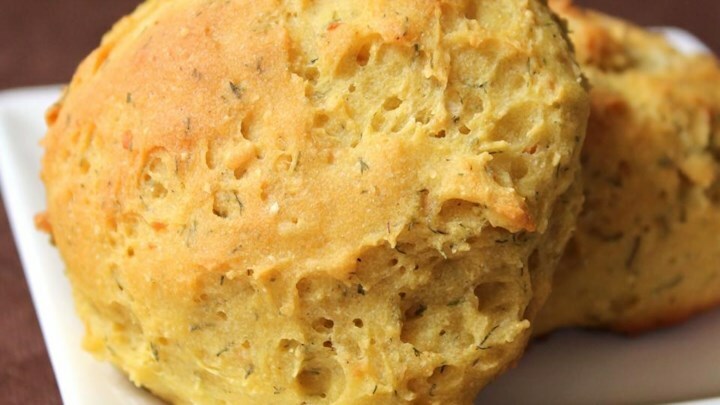 If you want just plain gluten-free dinner rolls omit garlic and dill. If you want a loaf of bread instead of rolls, place in a 9×9-inch baking pan and bake according to the same baking time.